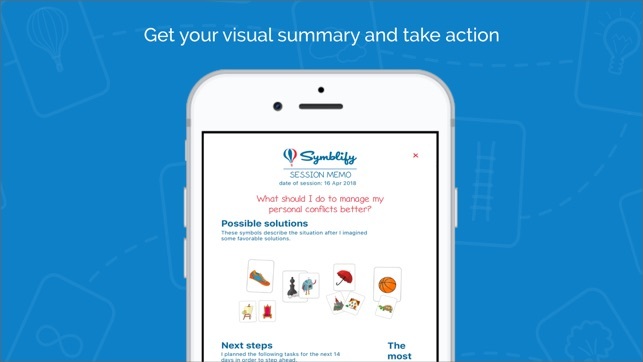 Symblify is a creative life coaching app that helps you to deal with your difficult problems on your own. Organize your thoughts, change perspective and get solutions in a simple and intuitive way. A life coach in your pocket for the price of a book. >>> What is Symblify good for? Do you have something that bothers you in your career, relationships, family or personal development? 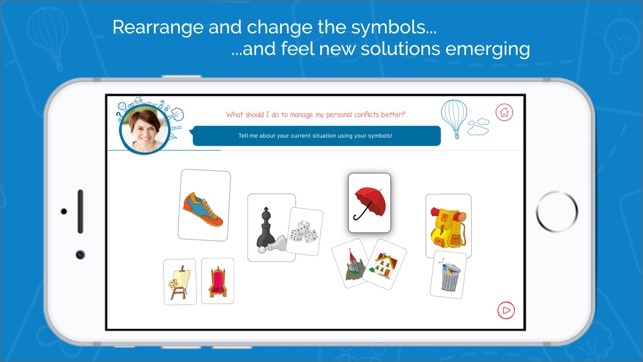 Just start a Symblify session, and in 20 minutes you will see things in a clearer and more organized way, from a different perspective and with a tangible next step in your hand. >>> Why is Symblify different from other self-help applications? 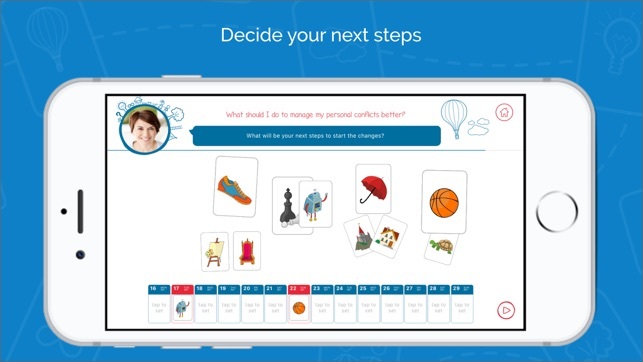 - Because it uses powerful symbol cards to activate the right brain and let you use your whole mind (based on neuroscience and Gestalt psychology). - Because it goes deeper than habits. It helps you understand your true motives, feelings and priorities, change the way you see your situations and, through that, find unexpected solutions to seemingly difficult problems. - Because you don’t need to use it regularly to experience tangible changes in your life. Sometimes one Symblify session is enough to start a change process in you. It's available in your pocket, and you can use it any time you get stuck, need an inspiration or want to change something in your life. >>> How does Symblify work? You can have any type of topic - a problem, a question, an idea – you would like to think through and take a step forward. 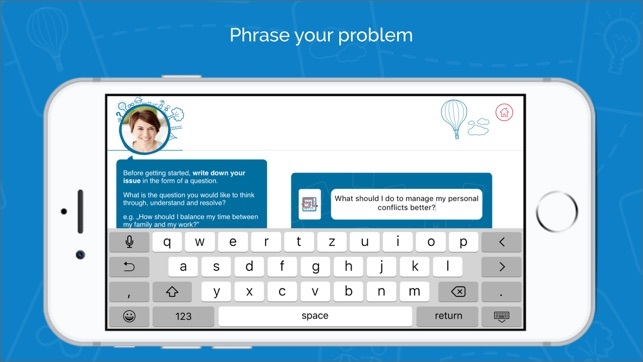 You just open the app, start a new session and phrase your topic in the form of a sentence. You will then be asked questions and you can select from randomly appearing symbol cards in order to answer these questions. Symbols awaken your right brain and make those resources in your mind available which are usually in sleep mode. Through the session you are guided by a life coach avatar, Julia. Her speech is modeled on professional life coaches’ sentences and questions, and is based on a solid psychological background. She encourages you to speak about your thoughts and feelings, allowing you to change perspectives and find new ideas. She helps you to think about your situation in an organized way, while your discoveries, solutions and next steps are done by you yourself. At the end of each session you are one step forward, compared to where you were when you started the session. This step is sometimes enough to solve the situation. Other times you have a new question emerged, and you are free to put it in a new Symblify session. You can then discuss your discoveries and resolutions with a friend or a family member. >>> What do you get when you download Symblify? You may personalize your application any time by adding new scripts and cards via in-app purchases. Cards are important in order to move your imagination and boost the problem solving process. New card sets can unlock new resources and help new ideas to emerge in your mind. I understand why you may be skeptical about how moving pictures would solve your problems. But in half an hour, I figured out a problem that had stumped me for years. Now I have a plan to resolve it. This app is the best $15 you will ever spend on helping yourself. I know it was for me. Thank you for your feedback! 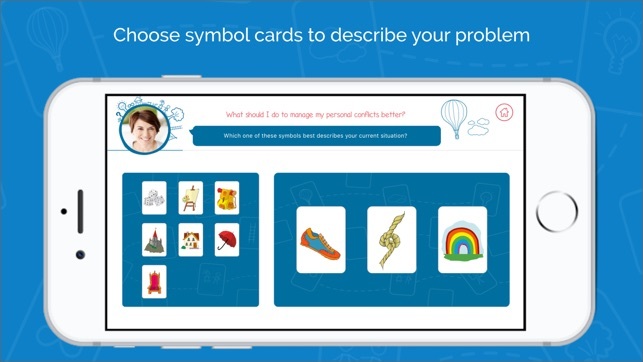 We are happy to hear Symblify could help you find a way how to solve your long-standing problem. That's exactly what we made this app for. My favorite part is when you choose the symbols for your situation. And then when you move them on the screen and talk about your situation, it’s really like creating a cartoon about my life. I love zooming in the symbols, and covering those I don’t like to see… :) The whole app has a really funny and easy atmosphere. I love it! Thank you for the incredibly apt metaphor! It's good to hear that you love Symblify's funny and easy atmosphere. It's easier to solve a problem in an enjoyable atmoshpere, isn't it? Time management and productivity issues can well be handled by Symblify. It's good to hear that the app helped you to find new ways and also energy to deal with your problem.